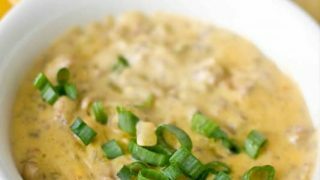 Green Chili Cheeseburger Dip – a delicious, hearty green chili queso dip with ground hamburger that is the perfect easy appetizer for a crowd! 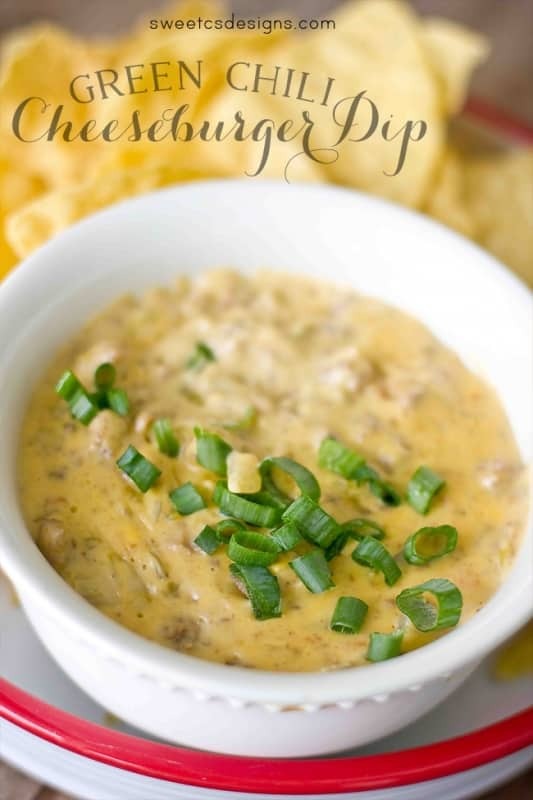 Green Chili Cheeseburger dip isn’t just something you dip your chips in… it is soooo delicious. Ok… so I hate calling this dip a “recipe” (since really, you’re just tossing a few things in a pan), and Velveeta can’t really be counted as food, right? Except… this dip is SO good. 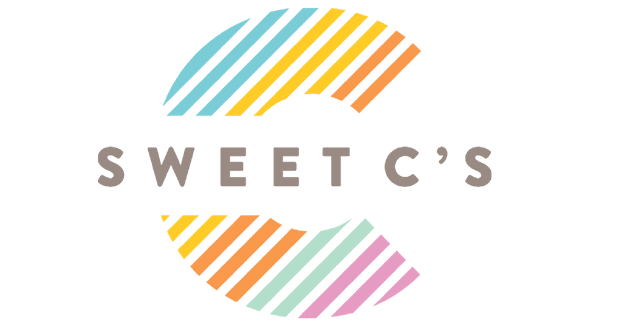 Like, really, really insanely good. You won’t stop eating it until the bowl is gone good. We’ve never had leftovers good. So if you’re getting ready for the big game, spring parties, summer BBQs, and Fall Tailgating- this is going to be your new go-to! And, in case the term “velveeta” didn’t send up a red flag- this is 100% not diet food. Or in any way healthy. But darnit- even though I love different and interesting cheese, they put some kind of delicious chemical into velveeta. It is perfect for ultra indulgent football party game food! Another great tip: if you have a fondue pot, that is a perfect and easy way to serve this and keep it warm. Just make sure you dont put it above low- it can burn. Stir it occasionally throughout your party to make sure none is burning and that the temp is ok. Sometimes I turn it on, melt it to a volcanic temp, and turn off the fondue pot. 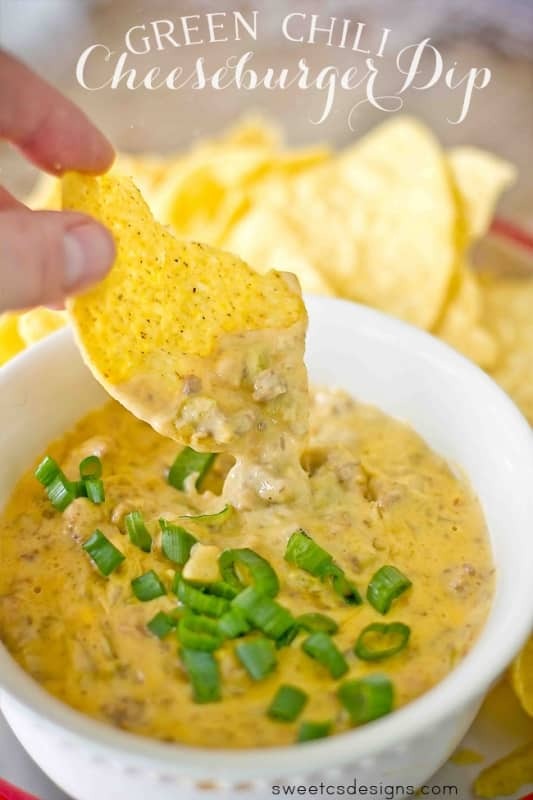 If you love this easy green chili cheeseburger queso dip as much as I do, please give it a five star review and help me share on facebook and pinterest! 1 cup chopped chives, for garnish. In a large, nonstick pan, brown ground beef. Cut Velveeta in to 3" squares. Add into pan on medium. Add cans of green chili to pan. Cook on medium heat until Velveeta is completely melted, stirring often so it doesnt burn or get crusty. Serve hot and garnish with chives or green onions.